Our gardens fosters a love of science and nature among kids who are living in some of New York City’s under resourced communities. 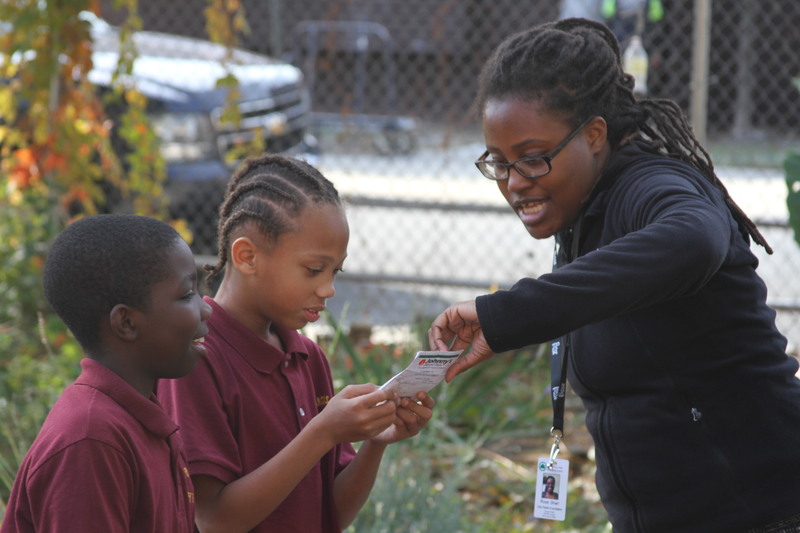 Learning Gardens provides hands-on lessons for elementary and middle school kids during the school year, and group programs during the summer, teaching kids the fun of community gardening, growing food, understanding biodiversity of our urban environment and more. The Learning Gardens Summer Groups Program is a Science-based experiential program that offers youth the opportunities to understand the importance of urban gardens through hands-on lessons in garden maintenance, games, and fun science-based activities. Students practice horticultural techniques and learn concepts related to community gardening, growing food and healthy eating. Groups of up to 25 students are invited to register for this 6-week program. For more information on Learning Gardens Summer Group program or to become a partner for summer 2019, please contact jlock@cityparksfoundation.org or call (212) 360-2745. Elementary and middle school students can participate in a series of 14 hands-on science lessons throughout the school year. Lessons are conducted outdoors in a garden during fall and spring, and in the classroom during the winter. Students study pollinators, explore biodiversity and learn how to care for the natural world. Two professional development workshops and supplemental resources are provided for participating teachers. For more information on Learning Gardens school program or to become a school partner, contact mhara@cityparksfoundation.org or call (212) 360-2744. The Learning Gardens Training Program engages high school students in five months of garden based learning, exploring topics including organic gardening, food justice, and urban sustainability. Students develop leadership skills and earn high school credit after completing 60 hours of instruction, with the opportunity to participate in a paid summer internship with City Parks Foundation. The Application Period for 2019 is now closed. For more information on Learning Gardens High School training program or to become a school partner, contact ghayes@cityparksfoundation.org or call 212-360-1485. Generous private support is provided by American Honda Foundation, The Carroll and Milton Petrie Foundation, Con Edison, The Levitt Foundation, Dr. Robert C. and Tina Sohn Foundation, Jane and Frances Stein Foundation, Michael Tuch Foundation, and The Barker Welfare Foundation. Public support is provided by the NYC Council. In partnership with NYC Parks.